A group of scientists led by researchers from the University of Rochester and North Carolina State University have for the first time sent a message using a beam of neutrinos � nearly massless particles that travel at almost the speed of light. The message was sent through 240 meters of stone and said simply, "Neutrino." "Using neutrinos, it would be possible to communicate between any two points on Earth without using satellites or cables," said Dan Stancil, professor of electrical and computer engineering at NC State and lead author of a paper describing the research. "Neutrino communication systems would be much more complicated than today's systems, but may have important strategic uses." "Of course, our current technology takes massive amounts of high-tech equipment to communicate a message using neutrinos, so this isn't practical now," said Kevin McFarland, a University of Rochester physics professor who was involved in the experiment. "But the first step toward someday using neutrinos for communication in a practical application is a demonstration using today's technology." At Fermilab the researchers had access to two crucial components. The first is one of the world's most powerful particle accelerators, which creates high-intensity beams of neutrinos by accelerating protons around a 2.5-mile-circumference track and then colliding them with a carbon target. The second is a multi-ton detector called MINERvA, located in a cavern 100 meters underground. Today, most communication is carried out by sending and receiving electromagnetic waves. That is how our radios, cell phones, and televisions operate. But electromagnetic waves don't pass easily through most types of matter. They get blocked by water and mountains and many other liquids and solids. Neutrinos, on the other hand, regularly pass through entire planets without being disturbed. Because of their neutral electric charge and almost non-existent mass, neutrinos are not subject to magnetic attractions and are not significantly altered by gravity, so they are virtually free of impediments to their motion. 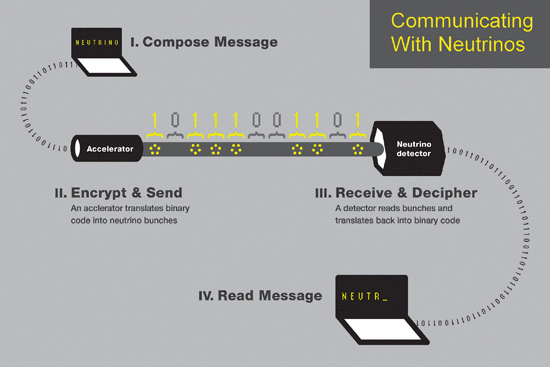 The message that the scientists sent using neutrinos was translated into binary code. In other words, the word "neutrino" was represented by a series of 1's and 0's, with the 1's corresponding to a group of neutrinos being fired and the 0's corresponding to no neutrinos being fired. The neutrinos were fired in large groups because they are so evasive that even with a multi-ton detector, only about one in ten billion neutrinos are detected. After the neutrinos were detected, a computer on the other end translated the binary code back into English, and the word "neutrino" was successfully received. "Neutrinos have been an amazing tool to help us learn about the workings of both the nucleus and the universe," said Deborah Harris, Minerva project manager, "but neutrino communication has a long way to go before it will be as effective."